This is a listing of countries with McDonald's restaurants. McDonald's is the largest chain of fast food restaurants in the world. It has more than 35,000 outlets worldwide. 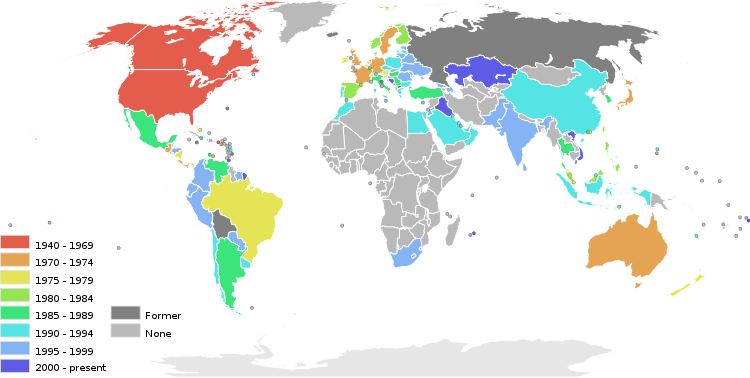 The majority of McDonald's outlets outside of the United States are franchises. The biggest temporary McDonald's restaurant in the world was opened during 2012 Summer Olympics in London, which had 3,000 square metres (32,000 sq ft). The biggest still standing one is probably that at Will Rogers Turnpike. The list of countries follows the company's own calculation, and contains several non-sovereign territories. Australia May 30, 1971 Yagoona, New South Wales 981 (source: McDonald's 2013) 26,613 First outlet in Oceania and first outlet outside the Americas. See McDonald's Australia. Locally known as Maccas. (part of United States) June 10, 1971 Dededo 6 (source: Statista 2016) 27,166 First outlet in Micronesia. Japan July 21, 1971 Tokyo 2,975 (source: McDonald's 2015) 42,598 First outlet in Asia, see McDonald's Japan; McDonald's Holdings Company Japan, Inc. locally known as makku(マック). France (details) June 30, 1972 Créteil 1,419 (source: McDonald's December 2016) 45,708 First outlet in Creteil in 1972 even though McDonald's officially recognizes the first outlet in Strasbourg in 1979. See McDonald's France. El Salvador July 20, 1972 San Salvador 20 (source: 2018) 490,538 Left in 1980 during the Salvadorian Civil War, but returned after the war in 1992. ( British Hong Kong at the time) January 8, 1975 Paterson Street, Causeway Bay, Hong Kong Island. 237 R(source: McDonald's 2013) 31,118 First outlet in a Chinese-speaking territory. Hong Kong was then a British Crown colony/Dependent Territory; McDonald's would open up a restaurant in China itself 15 years later. See McDonald's Hong Kong. Bahamas August 4, 1975 Nassau 3 (source: Dec. 2012) 131,000 First outlet in an independent country of the Caribbean. First South Island restaurants opened at Linwood and Merivale, both Christchurch, on 3 November 1987. See McDonald's New Zealand. Taiwan January 28, 1984 Minsheng East Road, Taipei 413 (source: 2015) 56,949 All restaurants were temporarily closed in 1992 during investigations of restaurant bombings in Taiwan; they reopened after investigations had concluded. Cuba April 24, 1986 Guantanamo Bay 1 (source: Dec. 2012) 11,239,000 Guantanamo Bay; open only to military personnel. Argentina November 24, 1986 Belgrano, Buenos Aires 222 (source: Jun. 2018) 207,736 see McDonald's Argentina. April 11, 1987 Rua do Campo, Cathedral Parish, Macau Peninsula 27 (source: Dec. 2012) 24,111 Then Portuguese territory; McDonald's would only open a restaurant in Portugal itself 4 years later. see List of restaurants. PR of China October 8, 1990 Dongmen, Luohu District, Shenzhen 2,700 (source: May 2018) 516,670 See McDonald's China. The company claimed this as McDonald's "100th country" although this calculation included many non-sovereign territories. See McDonald's Belarus. Trinidad and Tobago May 6, 1997 The Falls at West Mall 6 225,000 McDonald's previously had stores in Trinidad (May 6, 1997 – October 25, 2003) but closed due to low sales. Re-opened at The Falls At West Mall in 2011 and has expanded to 5 other locations. Iraq August 10, 2006 Baghdad 1 (source: 2006) One location in Baghdad for the U.S. Army, but there is also a knockoff called MaDonal. Kenya Coming Soon Nairobi (source: 2017) Announced on December 10, 2017. McDonald's is still yet to open in Kenya. Iran circa 1971/1972 1979 First outlet in the Muslim world and first outlet in the Middle East (West Asia). Closed due to the Islamic Revolution; a lot of foreign companies, specifically American, were forced to leave. McDonald's attempted to re-enter the Iranian market in 1994, but this failed due to a hostile anti-American fundamentalist attack on the building which was under construction where the planned franchise would be opened. McDonald's does not plan on opening any restaurants in Iran at this time. Barbados  August 25, 1989 December 13, 1990 Closed due to extremely slow sales. Bermuda  November 10, 1985 March 9, 1995 Closed due to a government law that bans franchised restaurants in the country. The McDonald's restaurant was located on a US Naval Air Station and was thus exempt from the law. When the base closed in 1995, the restaurant was required to do likewise. Bolivia October 24, 1997 September 30, 2002 Closed due to slow sales and cost. McDonald's is trying to re-enter the Bolivian market. Jamaica  April 15, 1995 October 14, 2005 Closed due to governmental problems and declining sales. Montenegro June 1, 2004 2007 A seasonal McDonald's restaurant was opened in Budva, but it was closed due to the lack of location. Iceland  September 1, 1993 October 31, 2009 Closed down by Icelandic affiliate due to both prohibitive costs of importing foreign food products as required by McDonald's and the collapse of the Icelandic krona. Its three former outlets were re-branded as its own chain of Metro restaurants, which offer similar services and menus with domestically produced ingredients. North Macedonia September 6, 1997 May 15, 2013 Closed due to dispute in contract and contractual obligations with the franchise owner Sveto Janevski. ^ a b "A VERY Big Mac! World's biggest McDonald's with 1,500 seats to be built for games". Daily Mail. April 22, 2012. Archived from the original on 2012-11-02. Retrieved 2013-04-23. ^ Hanna, Laurie (25 June 2012). "Fast food takeaway: Inside the world's biggest McDonald's which will be open for just six weeks". mirror.co.uk. Archived from the original on 2017-02-22. Retrieved 1 February 2017. ^ Tepper, Rachel (April 30, 2012). "PHOTOS: World's Largest McDonald's Coming To London Olympics". Huffington Post. Archived from the original on 2013-05-28. Retrieved 2013-04-23. ^ Addley, Esther (July 28, 2012). "Olympic Games 2012 olympics olys, McDonald's (business), Sport, Food and drink industry (Business sector), Business, Fast food (life and style), Food and drink (Life and style), Life and style". The Guardian. London. Archived from the original on 2017-02-02. Retrieved 2016-12-17. ^ Eccles, Louise (June 25, 2012). "McDonald's, supersized: First pictures inside the world's biggest fast food restaurant. . . yards from Olympic stadium". Daily Mail. London. Archived from the original on 2013-03-23. Retrieved 2013-04-23. ^ a b Clarke, Nicky. "Top 10: Stylish McDonald's". askmen.com. Archived from the original on 2017-06-20. Retrieved 1 February 2017. ^ "Store Finder – McDonald's Australia". Retrieved 2011-09-06. ^ Matsuda, Kiyotaka; Yui, Monami (8 January 2015). "McDonald's Japan Reports More Past Incidents of Objects in Food". Bloomberg News. Archived from the original on 2015-01-11. Retrieved 2017-03-08. ^ "Erstes McDonald‘s in Ostdeutschland feiert Jubiläum" Archived 2018-01-04 at the Wayback Machine. Voigtland-Anzeiger. 2010-12-26. Retrieved 2018-01-03. ^ a b c "McDonald's Germany". www.mcdonalds.de (in German). Archived from the original on 2018-07-09. Retrieved 9 July 2018. ^ "15 Fascinating facts about McDonald's in UK". telegraph.co.uk. Archived from the original on 2018-05-21. Retrieved 21 May 2018. ^ "20 years of Big Macs as McDonald's marks Scottish anniversary". scotsman.com. Archived from the original on 2018-05-22. Retrieved 21 May 2018. ^ "About Us :: McDonald's Hong Kong". mcdonalds.com.hk. Archived from the original on 2017-02-25. Retrieved 1 February 2017. ^ "Organisation- Mcdonald's New Zealand". Archived from the original on 2011-09-02. Retrieved 2011-09-06. ^ "McDonald's New Zealand founder dies". National Business Review. 2010-05-26. Archived from the original on 2010-05-30. Retrieved 2010-05-30. ^ Hepozden, Rosemary (2011). O'Flaherty, Brian (ed.). Golden Arches under Southern Skies: Celebrating 35 years of McDonald's in New Zealand. in co-op with McDonald's Restaurants (NZ) Ltd. Auckland: Renaissance Publishing. pp. 112–5. ISBN 978-0-9864521-1-6. ^ "No Brasil desde 1979, McDonald's é fast-food preferido dos paulistanos". folha.uol.com.br. Retrieved 1 October 2018. ^ "Tu Restaurante | McDonald's España". McDonald's España. Archived from the original on 2016-08-08. Retrieved 2016-08-11. ^ "500 McDonald’s outlets by 2020 - Business News - The Star Online". thestar.com.my. Archived from the original on 2017-04-17. Retrieved 1 February 2017. ^ "Tu Restaurante - McDonald's España". mcdonalds.es. Archived from the original on 2017-02-02. Retrieved 1 February 2017. ^ "Chi siamo | Azienda". McDonald's Italia. Archived from the original on 2018-12-17. Retrieved 2018-12-16. ^ "McDonald's - Le nostre cifre". McDonald's Italia. Archived from the original on 2017-09-24. Retrieved 24 September 2017. ^ "McDonald's Türkiye". mcdonalds.com.tr. Archived from the original on 2015-05-30. Retrieved 1 February 2017. ^ "26st McDonald's in Serbia opens in Shoppi Retail Park Borca". Archived from the original on 2016-10-13. Retrieved 2016-10-13. ^ "McDonald's Magyarország". mcdonalds.hu. Archived from the original on 2018-12-15. Retrieved 1 February 2017. ^ "Найти ресторан Макдоналдс". mcdonalds.ru. Archived from the original on 2017-01-03. Retrieved 1 February 2017. ^ "Les restaurants McDONALD's | McDONALD's Maroc". Archived from the original on 2017-06-18. Retrieved 2017-06-23. ^ "Restorani Latvija". mcdonalds.lv. Archived from the original on 2011-07-22. Retrieved 2011-01-26. ^ "Ettevõte arvudes". mcdonalds.ee (in Estonian). 10 May 2014. Archived from the original on 2014-05-12. Retrieved 10 May 2014. ^ "Sisak dobiva prvi McDonald's" (in Croatian). Archived from the original on 2011-07-16. Retrieved 2 June 2011. ^ Lapinytė, Jurgita (February 13, 2015). "Vilniuje netrukus bus atidarytas dar vienas "McDonald's" restoranas". 15 min. Archived from the original on 2015-05-25. Retrieved May 24, 2015. ^ "126 McDonald's outlets in north, east India still open: Bakshi". The Economic Times. September 10, 2017. Archived from the original on 2017-09-10. Retrieved September 12, 2017. ^ "How Big Mac plans to change Indian food habits". business.rediff.com. Archived from the original on 2010-10-29. Retrieved 27 Oct 2010. ^ "Why you can't (legally) buy a Big Mac in El Salvador". miamiherald. Archived from the original on 2017-08-11. Retrieved 2017-08-11. ^ "McDonald's". mcdonalds.com.pk. Archived from the original on 2016-12-02. Retrieved 1 February 2017. ^ "McDonalds Azerbaijan". mcdonalds.az. Archived from the original on 2015-04-02. Retrieved 1 February 2017. ^ "Press Articles - Big Mac To Be Grilled In JA". mcspotlight.org. Archived from the original on 2017-05-31. Retrieved 1 February 2017. ^ "McD's Banned In British Colony". hartford-hwp.com. Archived from the original on 2016-03-04. Retrieved 1 February 2017. ^ "Vísir - McDonalds hættir á Íslandi". visir.is. Archived from the original on 2016-04-02. Retrieved 1 February 2017. This page was last edited on 21 April 2019, at 21:11 (UTC).